I got a Facebook birthday reminder for a friend who is dead more than a year now. There are two other dead friends I get such reminders for. It is upsetting but with this latest incident I suddenly realized I can just go unfriend them. Which I did. I suppose that makes me a fair weather friend. Should have occurred to me sooner. People, please think about your digital legacy. There are services that will do it for you. Of course there are. If there is a way to make money, someone will think of it. But my feeling is, if they don’t do it, I won’t know and I certainly won’t be able to complain even if somehow I know. So I gave all my passwords to all my accounts to my sister and my son. Of course I am not sure I can trust them so I activated Google’s Dead Man Switch which is very handy and free. If my Google related accounts are inactive for three months they will call me. If they can’t reach me, they will email my sister and my son. I even got to write the email: “YO! If you are reading this email I am dead and you didn’t shut down all my online accounts like you promised. Now go do it you putz!” Slightly rude but why should I be any different dead? You can set the time for any length of time of inactivity you want. Frankly, if I am not on Google in one way or another for one day, something is probably wrong. But I gave them three months. They might not do things right away being so busy grieving and all. 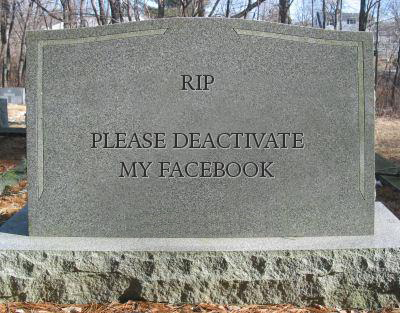 Of course there are people who want to live on online even after they die and Facebook will turn their page into a memorial page. And there are services (of course) that will take of keeping you virtually alive. But whether you want to live forever in the virtual world or like me, when you are dead you are done, you should do something about it now. There, I’ve done my Public Service Announcement. Of course there is another way to be dead when you are still alive – a dead blog. It was blogged about by Daily (w)rite not long ago. I must admit I have a couple of dead blogs floating around out there. Attempts I made to blog that just didn’t take for me. And I would love to take them down but I have long since forgotten where they are or what they were called. So if you ever come across one, send me the link. There is one I would really like to find because it had all my wedding pictures and I lost those when my last computer died. This entry was posted on August 15, 2013, in Rants Raves and Reflections. Bookmark the permalink.